This uniform is made from Diamond Lines Fabric, It has been specially designed for International Taekwondo Federation sparring and competition. The fighter suit is made up of 100% polyester material. It has a full length gusset allowing for even greater freedom of movement during high kicking Taekwondo event.. The fighter suit is made up of 100% polyester material. 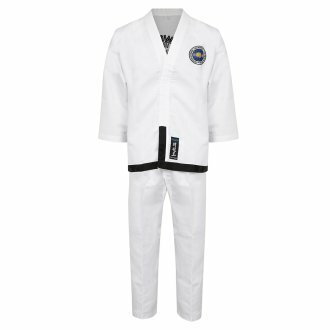 It has a full length gusset allowing for even greater freedom of movement during high kicking Taekwondo events. Elasticated and drawstring trousers ensure a comfortable fit during extreme training movements. This Dobok allows all athletes competing at a high level to equally feel comfortable and enjoy and be part of the experience.